Monetary donations are needed to help us fund our great raffle prizes. Donors will be acknowledged in our Pancake Breakfast program and on our website. Make a tax-deductible donation at http://bit.ly/pb-donate or contact smbsilentauction@gmail.com if you have further questions. A vacation rental such as a weekend at Tahoe, Napa Valley or the beach (you can set preferred dates). Host a “join the fun” party such as sharing an art/craft or help teach how to make a special dish for a set number of guests (i.e. Italian night). Contact smbsilentauction@gmail.com if you would like to help contribute to our fundraising efforts or have questions. View more information on our Pancake Breakfast event! The season of Winter Guard and Winter Percussion have arrived. Should you wish to contribute using your credit card, please visit our Color Guard online contribution page, or our Winter Percussion online contribution page. 1. What information does the system keep when I create an account at the online store? When you create an account at our store, you can enter your first & last name, address, phone number, company (optional), and they are retrieved when you login to contribute next time, so you don't need to re-enter them at the credit card checkout screen. When you login the next time, you can see what you have contributed. 2. How do I know what I contributed already? You can refer back to the email receipt that you get immediately after you contributed (sent from Webmaster for SMB with the title starting with "New Order #"), or email our treasurer. 3. We are here to answer questions you may have on the program, membership, program contribution, and online store. Please email your music director for program questions. Membership questions? Email our Membership co-chair, Beth or Annie. ​Welcome back to our 2018-19 school year! Parents can now contribute with their credit card for their membership donation and music programs. Checks are always welcome, as there is a transaction fee administered by Paypal, our payment gateway. ​Should you wish to contribute using your credit card, visit https://shop-saratogamusicboosters-com.3dcartstores.com​. Online contribution is now ready for the 2018-19 High School, and Elementary and Middle School music programs. 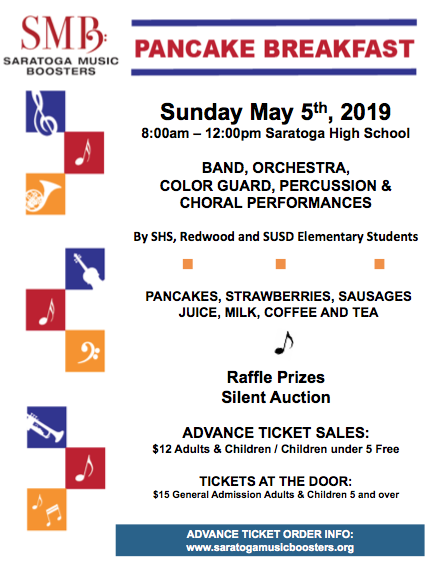 Be a member of Saratoga Music Boosters today! SMB and our music department appreciate your support and generosity in our 2018-19 membership drive. Any donation amount is welcome and is important to us. You can now choose to donate online, or send your check donation with the ​membership donation form (pdf) to your music teacher. Does your company have a corporate matching gift program? If yes, please contact your corporation for details on the matching gift program. Should your company need a donation receipt from you to start the matching process, please complete this receipt request form after you submitted your donation. Thank you. ​For all Saratoga High School band students, please fill out the buff colored paper form found on the magazine rack in the band room below to submit an excused absence. Remember, the form MUST be filled out at least two (2) weeks prior to requesting the absence. All requests are not guaranteed to be granted. NY Times article: Is Music the Key to Success? . Are you a new student in the district, or a new member to the program? Make sure you are officially registered for Band, Orchestra, Choir or Color Guard! Please contact Mr. Boitz, Mr. Shiuan or Mr. Ford for more information regarding the SHS Music Programs and which class you should enroll in.